“The “baby boomer” generation (1946-1964) grew up in a time of dramatic social change. Their experiences in the Cold War were very different from those of their parents. "Throughout America cocktail parties sparkled defiantly through the dreaded first minutes of January 20, 1920. With morning would come the official start of Prohibition. 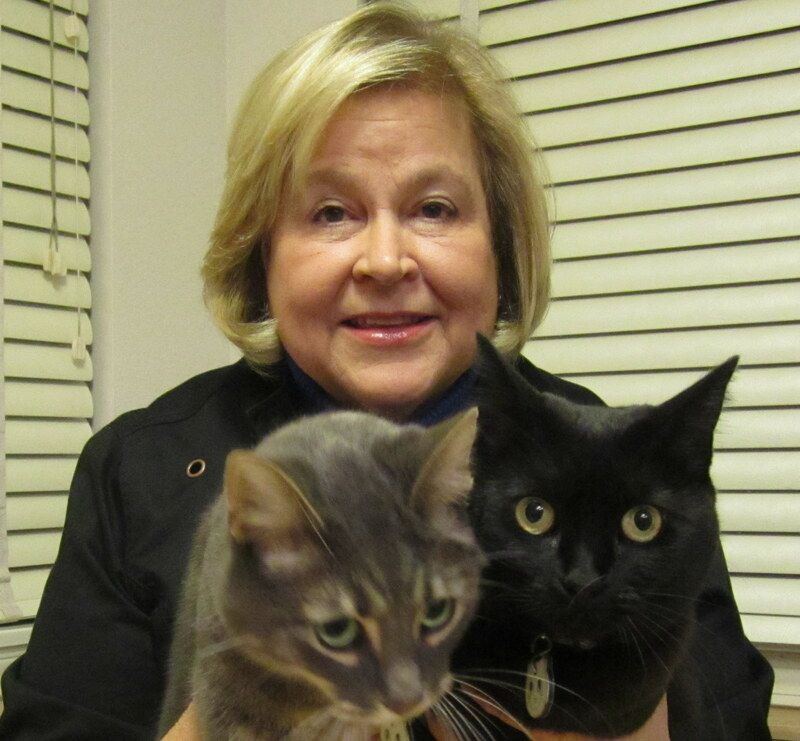 It was easy, however, to keep the party going in Long Beach, California..."
Welcome to my website, presided over by myself and two cats who claim to own me! They were the ones who insisted I include the chapter “Killer Cats?” in my book Murderous Intent? and mention how cats could have been used in combat missions in World War II—which I finally agreed to do and wrote about in Fighting Fear. My latest book is The Red Scare, UFOs & Elvis: Long Beach Enters the Atomic Age which was released in July 2018. It’s the 4th and final of a series of books I wrote which began with Murderous Intent? covering the 1880s-1920, followed by Prohibition Madness which dealt with the 1920s & 30s, then came Fighting Fear which talked about World War II. The Atomic Age, discussed in my latest book, began with the explosion of an atomic bomb over Japan in 1945. What was it like living here in Southern California after the end of World War II ? Some of you may remember, others might be too young to have experienced the fear of Communism, or rushing out in the early morning to witness the testing of an atomic bomb over Nevada, which lit up the Southland sky. It was a time when many built back yard bomb shelters, kids practiced “duck and cover” drills in school, and teens, who feared they might be the last generation on earth, turned their attention to a new style of music—Rock ‘n’ Roll. Strange, unidentified objects were seen in the sky. Were they secret aircraft the U.S. was testing, devises built by the Russians, or visitors from other planets here to witness how we were using our new found atomic energy? Died in Long Beach – Cemetery Tales was published in July 2016. Politicians, city founders, visitors, accident victims, Civil War veterans and those that died in the great influenza outbreak of 1918-19 are all discussed here, as well as the hospitals, doctors, undertakers and others who cared for the dead and dying. What made Long Beach’s “Cities of the Dead” different from all other cemeteries is the question of whether the bodies said to be there still remain. Also included is the history of Long Beach’s “cemetery wars” which erupted when oil was discovered on Signal Hill. Are any of the cemeteries haunted? That question was explored in Haunted Long Beach 2, but new stories have been added to Died in Long Beach. My book for 2014 was Fighting Fear – Long Beach in the 1940s. The underground crime, gangsters, murder, and political corruption which I described in Prohibition Madness continued, but another factor entered the picture—World War II. Between 1940 and 1944 the population of Long Beach jumped from 164,271 to 253,331 as thousands came here to work in the shipyards and aircraft factories springing up in and around Long Beach. It didn’t take a visionary to see that Long Beach would be a prime target for an enemy attack. The eastern portion of the city housed numerous shipyards and a Navy base, to the north was Douglas Aircraft Company, and the Army airbase at the Municipal Airport; to the west was the Los Alamitos Naval Air Station and the Seal Beach Weapon’s Depot. In the middle of Long Beach were countless oil wells, fueling the ships planes and other equipment needed to fight a war. I had two new books out in 2013. Prohibition Madness which is full of never before published material on what was going on in Southern California during those notorious days when the 18th Amendment was in effect—1920-1933. It’s a sequel to my earlier book Murderous Intent? which talks about events (including murder) in Long Beach and Southern California from the 1880s-1920. In late June Surfing Newport Beach: the Glory Days of Corona del Mar was published. I wrote it with my surfer husband, Paul. It’s a book on the history of surfing in Newport Beach/Corona del Mar in the days before World War II. It’s full of never-before-revealed facts about not only surfing, but the early history of Newport, Balboa, Newport Bay, and the Santa Ana River (and much about Long Beach, as well). If you want to learn more about my books, be sure to click on the book link in my headline bar. On this site you’ll find in my BLOG SECTION Yearly Histories of Long Beach, stories about Women, a history of Long Beach Public Library and tales of early Long Beach Subdivisions. The blog on subdivisions could have been a book, but I decided to make them available FREE on this site. You will find many tantalizing tidbits in my subdivision blogs such as Long Beach’s first linching, the horsewhipping of real estate agents, the scandal of the Seabright development and much more. My blog entitled Believe it or Not It’s True traces amusing stories about Long Beach and Southern California. I hope you will enjoy them and learn more about Long Beach history. Also, check out my other BLOGS at my Google blog site. You will find more Long Beach history by following this link to Historic Long Beach Blogspot . Then there are my two BLOGS for Seal Beach, Historic Seal Beach Blogspot, which highlights artist Henry De Kruif’s drawings advertising the city in 1913 & 1914 AND a continuing history of the city which you can find at Seal Beach History Blogspot. I didn’t forget Signal Hill. You’ll find that city’s history at Historical Signal Hill Blogspot. What is my latest project — a history of African Americans in Long Beach and Southern California. I hope you will find my books and blogs both informative as well as fun! Oh, yes! I’m pleased to announce I was listed as one of the top 9 Long Beach writers (with Upton Sinclair, John Fante, Richard Bach, Wendy Hornsby, John Leonard, James Hilton, and more) in the Long Beach Post newspaper! Long Beach is fortunate to have such an accomplished historian. Thank you for everything you do to keep our rich history alive. Long Beach librarian, researcher and author Claudine Burnett has, as is always the case, been a tremendous and reliable source of some of the facts in this book. There are some history writers in this town who use her research shamelessly (she is remarkably free with it) without giving her credit. I hope to never forget or neglect to mention the work she has done in archiving and preserving the city’s history in every aspect. ‘Soaring Skyward’ is another example of the good publicity and attention the city receives for its rich background in aviation.